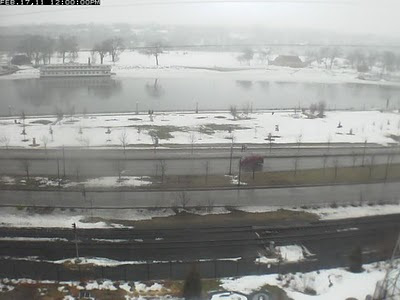 I just got word that the Science Buzz team down at the Science Museum of Minnesota once again has their time lapse Flood Camera set up taking daily photos of the Mississippi River in downtown St. Paul. (The feed is live but they haven't linked to it yet on their site. I'll share the link once they make it public.) Last year the camera captured the flooding downtown as the waters rose up and covered Harriet Island. While the flooding is still a few weeks away at this point, the camera has already revealed some interesting finds. 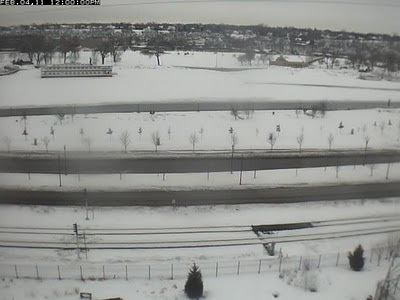 Here's the first image taken on February 4th. Snow covers the ground and the river is covered in ice. Eight days later, on the 12th, the river ice starts to crack and break up. Blocks of ice move downstream for a few days and then when this photo was taken on noon on the 17th, the river is free of ice. It will be very interesting to see what happens when the river crests. Come on back for more analysis and river flooding news or subscribe by putting your email in the box at the top right of the page. You'll automatically receive updates via email.